Brendan Russo, right, with Columbia Boys’ Varsity Basketball Coach Curtis Sankey. Columbia Boys’ Varsity Basketball player Brendan Russo was selected earlier this month as one of the 2018 Section II Boys’ Basketball Scholar Athlete Awards recipients in connection with News Channel 13. Mr. Russo spent the majority of his senior year recovering from a severe ankle and foot injury. 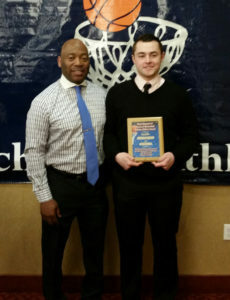 Nonetheless, he was recognized by the Section II Committee for his contribution to the Columbia basketball program, high standard of academic achievement, good citizenship, moral character, sportsmanship and leadership ability. Mr. Russo would like to thank all of his teammates, coaches, and teachers throughout the years, as well as his parents for the countless hours they’ve supported him as a student athlete. He is looking forward to attending college in the fall to study computer science.